I enjoy making special cakes for loved ones on their birthdays and was only too happy to make a Red Velvet Cake for my son’s girlfriend when she turned 21. I browsed through several cookbooks looking for good recipes. My first three attempts were unappealing, but after working on creating a good recipe, I came up with this version that is both delicious and gorgeous. Now, I look for occasions to make this cake as it has become my new favorite. 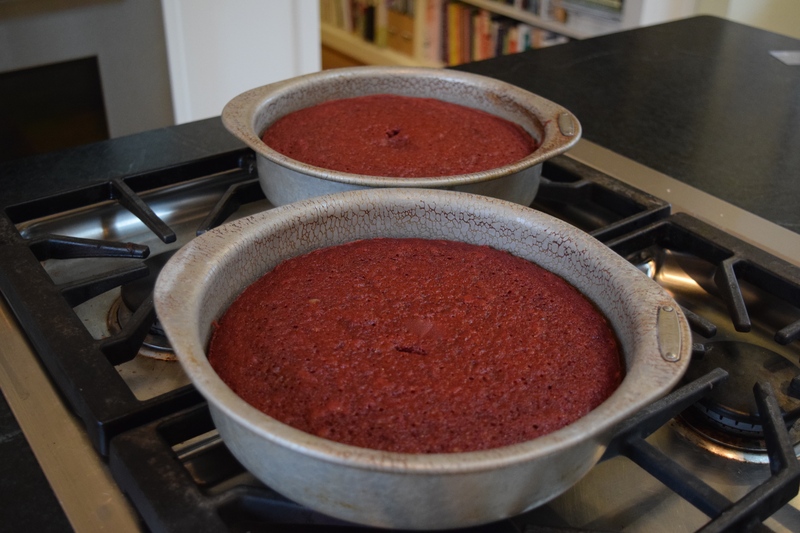 While doing research on the red velvet cake, I learned The Adams Extract Company, makers of food coloring and flavor extracts, is credited with making this cake popular during the Great Depression. As a marketing strategy, the company placed point-of-sale tear-off recipe cards of their food coloring products in stores. The idea to make a red cake took off from there. 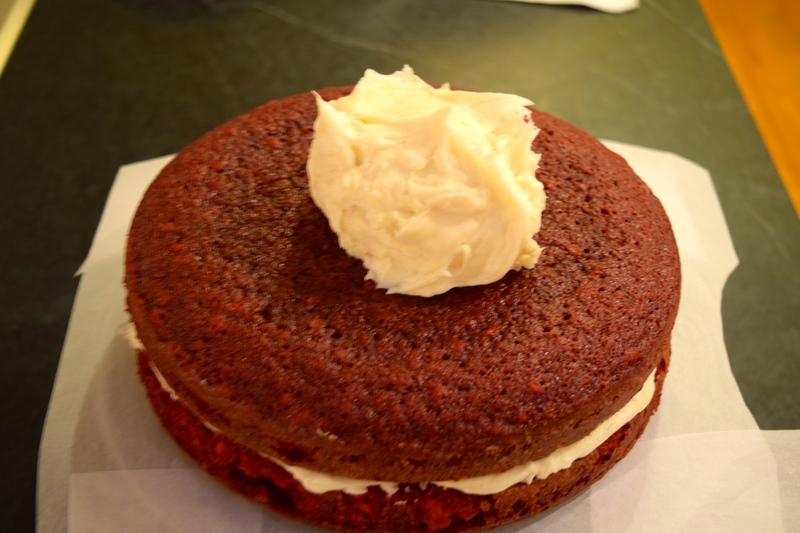 Red Velvet Cake is basically Devil’s Food Cake with food coloring. Preheat oven to 350º. Center a cooking rack in the oven. Grease two 8-inch or 9-inch cake pans with cooking spray or butter. Dust insides of pans with flour. Tap pans upside down over a trash can to remove excess flour. The pans need to be lined with parchment paper (waxed paper will work) as extra insurance the cake will not stick to the bottom of the pan. Even when I grease the living daylights out of cake pans, some cakes still want to stick to the bottom. This is one of them. Liners guarantee they will drop out easily. Draw an outline of the cake pan on two sheets of parchment paper. Use scissors to cut out the paper disks. If you trim to just inside the line, your disks should fit nicely inside the pans. Place a liner in each pan. No need to grease the liners. Beat together the oil, sugar, and eggs for three minutes on medium speed. Add the rest of the wet ingredients to the mixing bowl: buttermilk, vanilla, food coloring, vinegar, and coffee. Mix on medium-low speed for one minute. The batter should appear smooth. Beware, any speed higher than medium-low will splatter red batter all over you and your kitchen! In a separate bowl, mix the dry ingredients: the flour, chocolate, salt, baking soda, and baking powder. Spoon in 1/3 of this at a time into the mixing bowl and mix just until flour disappears on low-speed. You do not want to awaken the gluten in the flour by over mixing the batter. 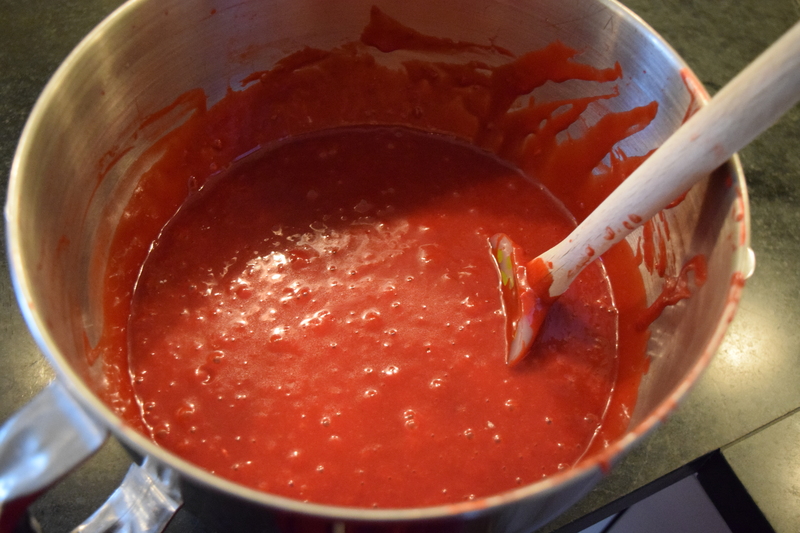 Be sure to scrape down the sides of the bowl with a spatula as you mix. Repeat two more times, using 1/3 of the dry ingredients each time. 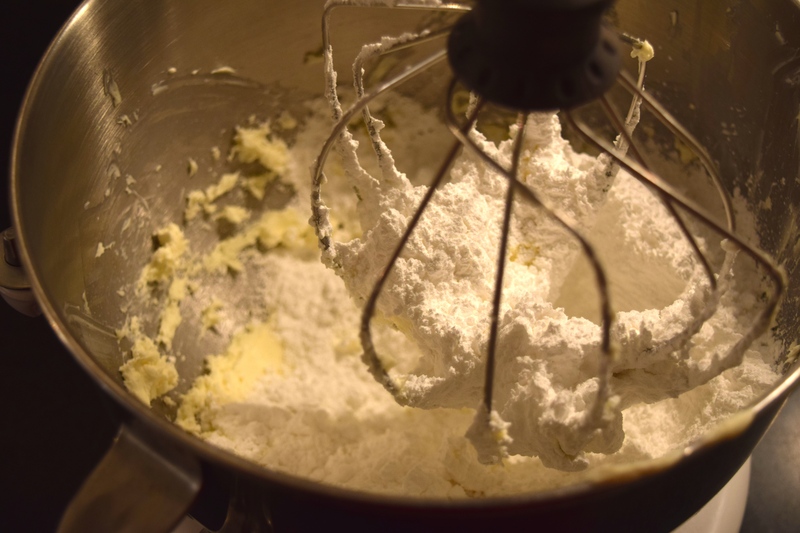 Mix until dry ingredients are fully incorporated into the batter. If you would like to make cupcakes instead of a cake, I would add ½ cup of chocolate chips to the batter at this point. Yum! Pour batter evenly into the two prepared pans. 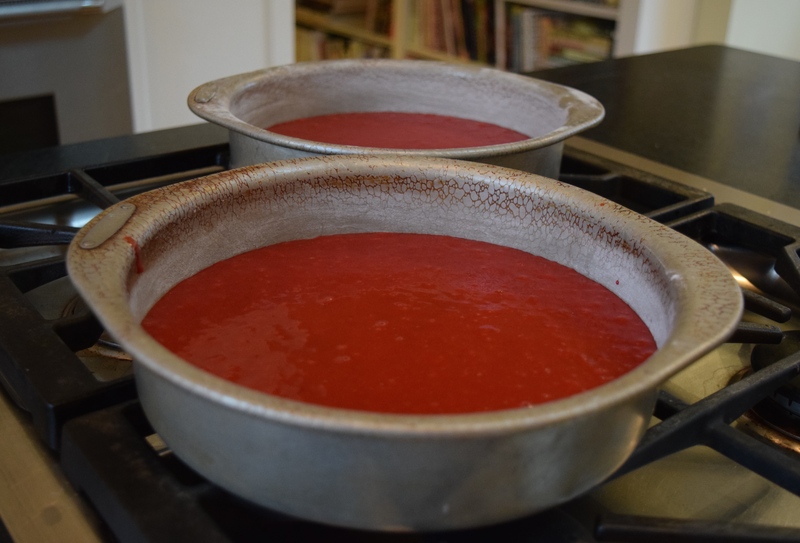 Place cake pans on the middle rack of the oven and bake for about 25 minutes, rotating the pans halfway through baking. Use a knife to check the center of cakes for doneness. If the knife comes out clean, the cake is done. If not, set the timer for five more minutes and recheck. Be sure to test each cake pan. When done, remove pans from oven and cool for 5 minutes. Run a knife around the edges of the pans to release the cakes from the sides. Turn pans upside down on a wire cooling rack and peel off parchment paper. Invert cakes and cool to room temperature. At this time, you could store them in plastic bags until ready to use, or go ahead and frost them. 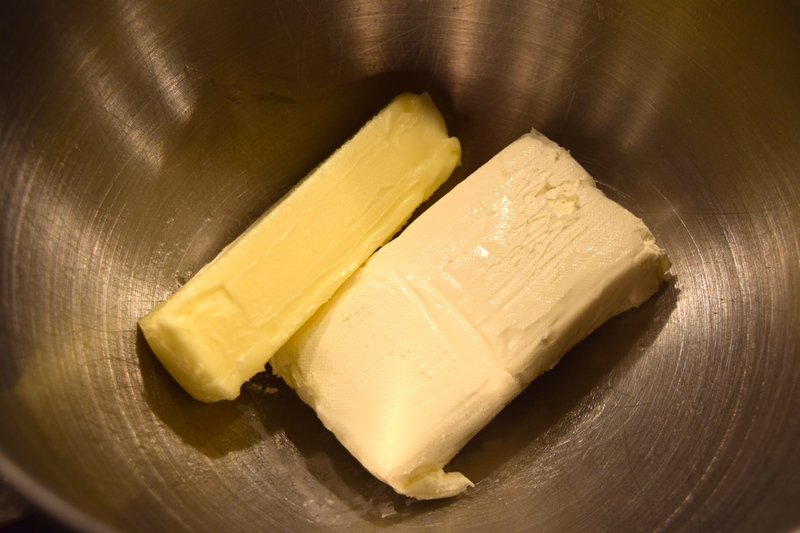 Beat butter and cream cheese together in a mixing bowl on medium-high speed until smooth. Add vanilla and beat 30 seconds more. 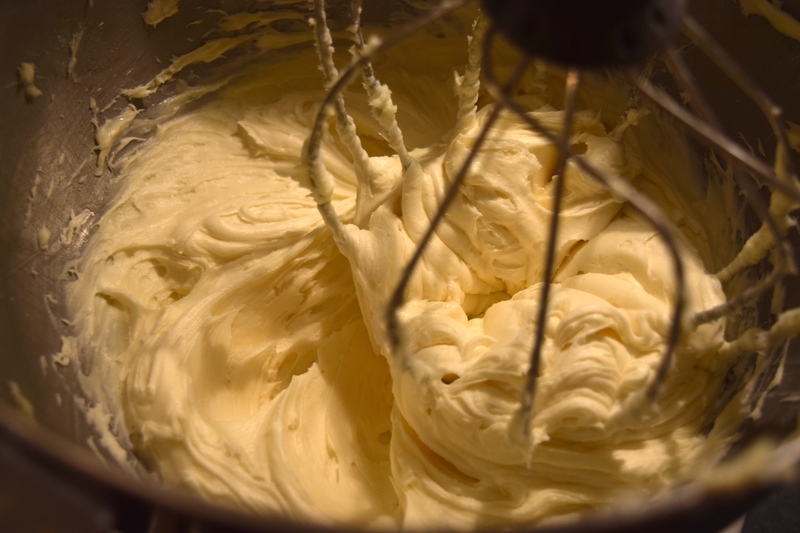 Add milk, one tablespoonful at a time, to thin frosting to desired spreading consistency. 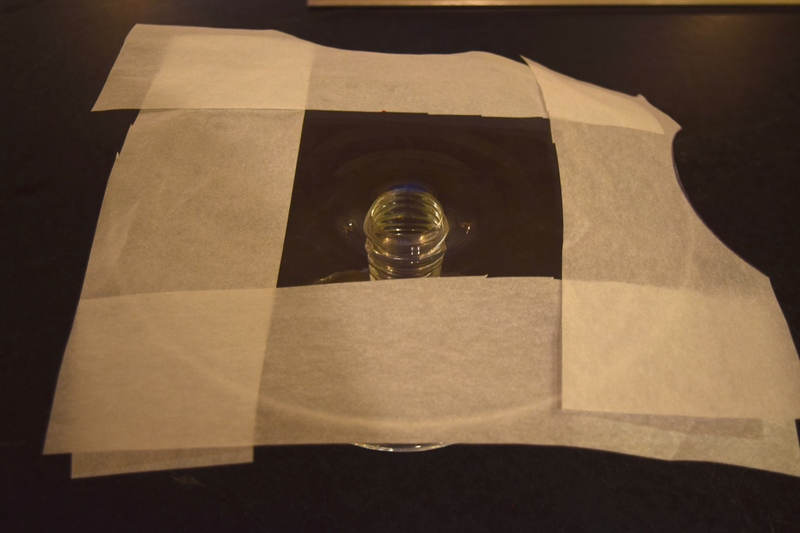 Line the edges of a cake plate with parchment paper, or plastic wrap, to protect the plate from drops of frosting. Place first cake layer down. Scoop up about 25% of the frosting and spackle it across the top with a long metal icing spatula. Place the top cake layer, smooth side up, over the frosted layer. 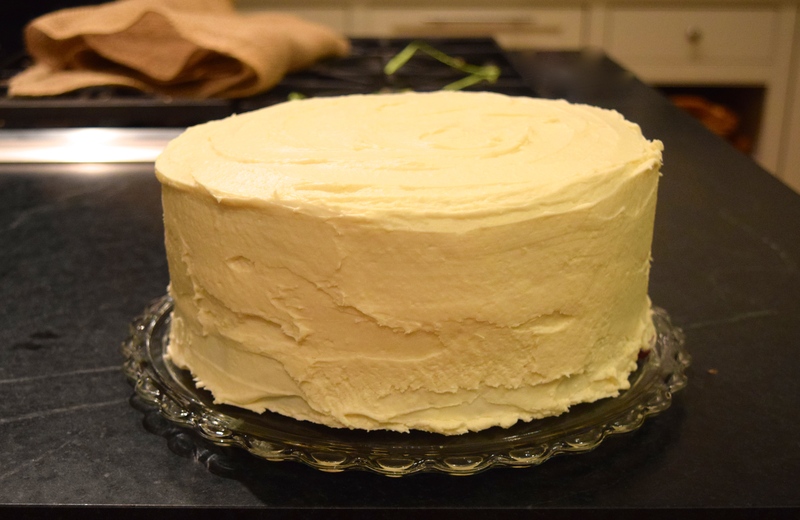 Place half of the remaining frosting on top and use it to frost the sides of the cake. Next, spoon the rest of the frosting on the cake and frost the top layer of the cake. 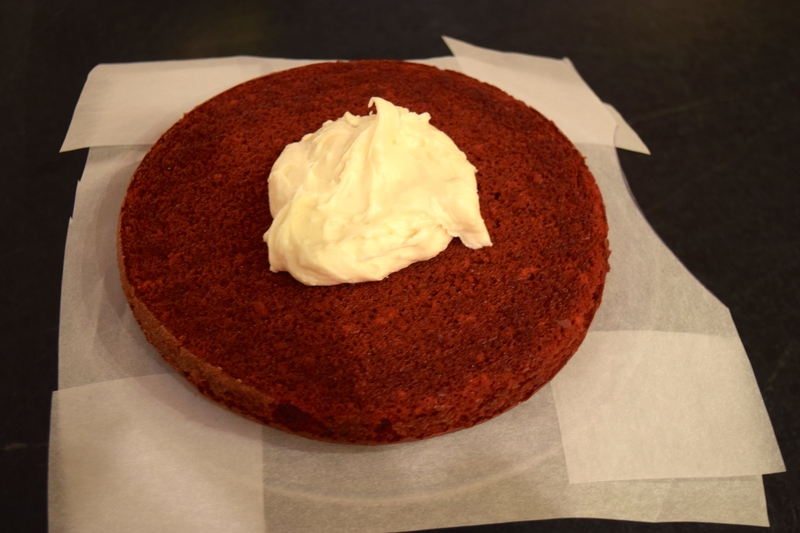 Remove parchment paper liner from cake plate while frosting is still soft. Let frosted cake sit for an hour or two so the flavors can blend. 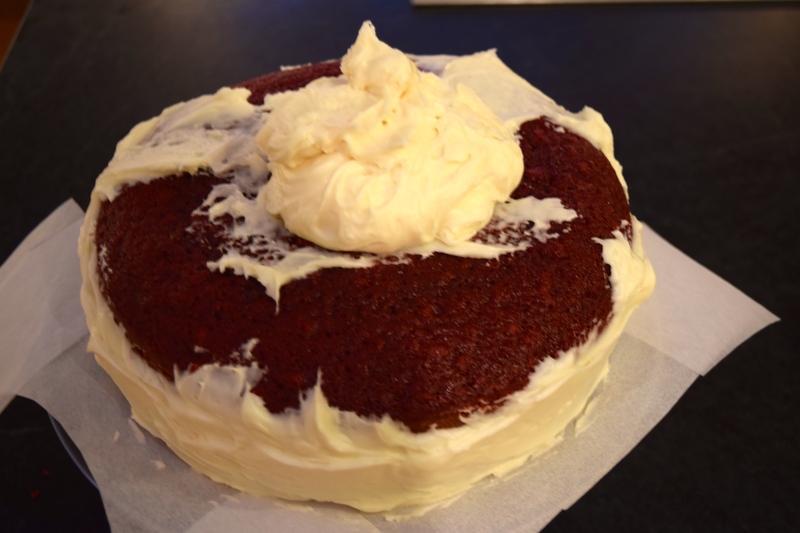 I like to chill all cakes with cream cheese frosting before serving, but that is a personal preference. Recently, I needed an elegant cake that would serve 20 people. 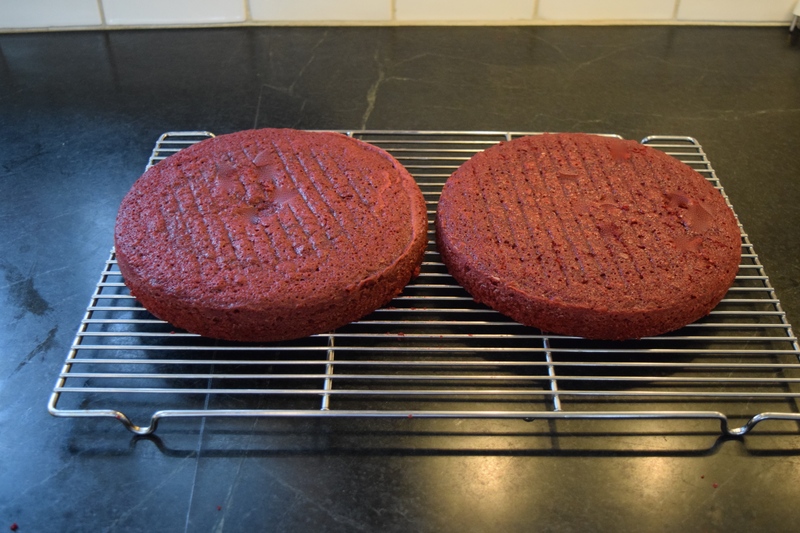 I decided to make a taller version of my red velvet cake by preparing one and a half cake recipes. This gave me three 9-inch layers. I increased the frosting recipe by half. The cake looked beautiful and regal on the dessert buffet.